When I meet pianist Lars Vogt in Rotterdam he is playing Beethoven’s Third Piano Concerto on four consecutive days with the Rotterdam Philharmonic and Leonard Slatkin. Lars Vogt is living in London nowadays, a city where he feels at home. He first came to public attention when he won a second prize at the 1990 Leeds International Piano Competition and has since gone on to give major concerto and recital performances throughout Europe, Asia and North America. 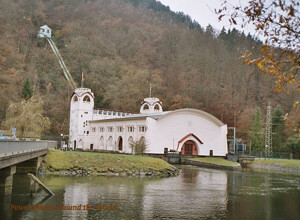 In June 1998 he founded his own festival in Heimbach (Germany) in a waterpower station. Known as “Spannungen” (Tensions), its huge success has been marked by the release of ten live recordings on EMI. He has also initiated an education project in Germany, called “Rhapsody in School”. His website is a very personal one, full of nice graffiti (Life without Mozart is empty – Let music into your life – Music…finding out about your soul) and a personal e-mail address on which I got an answer within a few hours! After finding a place for a coffee, I ask Lars about the Second Movement of Mozart’s Piano Concerto KV 488 which features so prominently on his MySpace page. Lars Vogt: I played it on my festival in Heimbach and it was a special performance with a kind of All-Stars-Orchestra: Christian Tetzlaff was leading the second violins, Antje Weithaas played and I had all these fantastic wind players! It was a real Dream Team. I read somewhere that Mozart is a bit your number one! That’s when I would be forced to choose only one composer! I am also close to Beethoven and I really love Schubert. I also like to play Shostakovitch’ chamber music and I just studied the Schönberg Piano Concerto, which is a wonderful piece. 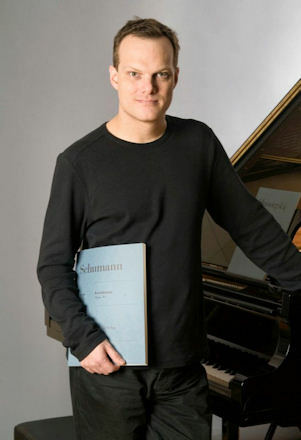 Lars Vogt is a name one immediately connects with the big Classical and Romantic German composers. Is that your wish or would you like to play more works from different composers? I know about this “stamp” and I don’t really find it a problem because I love to play this music and life is very short. There are of course more things I would like to do but I already know that I will not manage to do them all. Learning new pieces really takes me a long time: it’s a big effort. When I learn a new piano concerto, like the Chopin First now, I really have to schedule in a half year because I constantly play other concerts with other repertoire. You are very conscious in what you’re choosing? Well, not always, but I’m trying. I’m nearly forty now and I start to understand that things aren’t going on forever. The word No starts to be more and more important. One also has a private life and needs time to recharge batteries. But I still find it very hard to say no. People ask recital repertoire for a concert in two years: it is really difficult to know how much time I will need to prepare and to know which pieces I would like to play then. Did the wish to play other repertoire also make you start your own festival? Well, I certainly got to know a lot of repertoire there (also without piano!) because all these wonderful musicians come year after year! How did you find this beautiful Art-Deco power station in Heimbach? Actually it’s very close to where I grew up. I was very lucky to be supported by a local art-society and all the people involved are volunteers who take free from their work for the festival! They are really professional because each year they convert a running (!) power station into a concert hall with 550 seats. They are unbelievably enthusiastic. The man who manages the ticket sales just takes two and a half weeks of his holidays: he works in a hospital and just takes this time free! I was optimistic when we started but I could not imagine that it would be such a success. People are so anxious to get tickets that when we open the website for ticket sales, within 20-30 minutes the whole festival is sold out! What surprises me however is that when we go to play abroad with the same group of musicians the halls are not at all sold-out. Somehow everything comes together in a good way in Heimbach. What I never quite understand is that so many people are interested in orchestral music but only 200 people or so go to a chamber music concert. Is it logic that when there are more people on stage there are also more people in the hall? How do you manage to play a Beethoven concert on four consecutive days? To be honest, that’s quite easy! It’s much harder to have one rehearsal and one concert and then to have to go somewhere else to do the same piece with another conductor in a completely different setting. Or to prepare one concerto while playing another one. I like to focus on what I’m doing and this week I’m really enjoying myself! I can go deeper and deeper into the concert and really find new things each time! 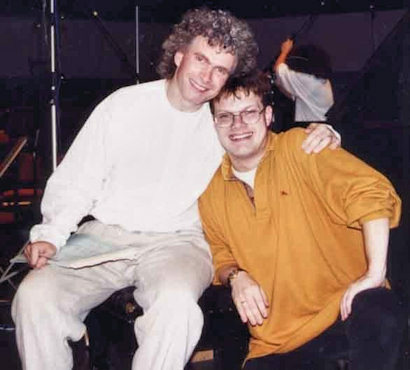 At this point Lars Vogt shows me a video on his cell phone on which Simon Rattle takes Lars’ seven-year-old daughter on stage in Berlin after the concert. My daughter and her Mom came to the concert. We played the Brahms First Piano Concerto and after the break I stayed backstage with her. After the symphony when Simon came out he gave her a high five and heard that she would like to go on stage. “Well, let’s go” he said. There where still a few hundred people in the hall who applauded. He is such a lovely guy! You didn’t really grow up in a “classical” family, didn’t you? No, I had just this good luck, if such a thing exists, to meet the most wonderful piano teacher! I really wish that my daughter would live close to her now! She has this talent to bring things out in people. When she noticed that I was talented she started to take me to the concert, gave me cassettes with recordings and already in an early stage putting the thought in my head that if I would practice I could become “a pianist”. I didn’t know what that meant of course. In fact my first idea was to be a mixture of a professional football player and a pianist! During the day I could play for Borussia Mönchengladbach and beat Bayern München and in the evening I would play concerts! Do you feel more like a musician or a pianist? I do feel like a musician but…painfully realising that as a musician you have to be able to do certain things on whatever instrument you play. It just takes work and coming to grips with the instrument so that it can do the things you want. And that is all the same for pianists, violinists and conductors. But you have to deal with a lot of different pianos! Yes, well, that can be difficult. It is also a very personal thing. I struggle for example with some technical aspects. I always play on Steinways (because I think they are the best) and there is something mechanical in recent years that I find very difficult to deal with. Some of the instruments are quite hard to play. So I asked my technician to change my keyboard at home in such way that it becomes as uncomfortable to play on as possible. If the touch is too light, too nice, when you practice, and you go to a hall with a new Steinway it is like kneading! The technical aspects of the piano are always there but at the same time you have to realise that they are only a way of going up the ladder towards being a musician. Did you ever play on period instruments? Well, I tried a bit, but not properly. But one day I would like to give it a shot. I would love to play for example with the Orchestra of the Age of Enlightenment. I would like to adopt the sound of a Steinway in a way that it would blend with their sound. I’m trying this actually here this week. There are very clearly parts of the Beethoven Concerto written for the dynamics of a fortepiano and I try to adopt my sound there. Like at the end of the development section of the first movement. The piano makes a huge crescendo and the orchestra has a diminuendo. It was meant that the Hammerklavier appears (out of nothing) from the orchestra there but if I make a proper “Steinway” crescendo I will kill it all. So I take my sound back and ask the orchestra to play a bit louder. Playing with a period orchestra the tuning also would be a problem of course: nobody will tune a Steinway so low. So in order to work with these so-called Period Orchestras (that by the way come very close to my style) I would have to sacrifice some of the colours of the Steinway. Tell me about your “Rhapsody in school project”! Is it meant for primary schools, secondary schools, or both? I even thought of going to kindergartens! Well, next week I will go to the primary school of my daughter in Berlin. I hope that children will see the emotional involvement of the artists and what it can mean to somebody. That was my basic idea when I started. That somewhere on a deeper level they will feel that there must be something in this music. Just to awaken their curiosity. In Holland when children see a piano for the first time they are often looking for the plug and the on/off switch! Well, you can’t blame the children! Our generation just doesn’t offer classical music anymore to the children. It is really ridiculous what is offered to the children. In a way it is a crime against humanity that we even don’t give them the possibility to like it! If they would get it offered and would think, “well, it’s not my thing”, that’s one thing. But if you don’t even offer it properly! You have to show them which emotions it contains: is it sad, angry or is it full of love, is it dramatic? You have to give them a chance to feel what could be in it! Where do you find people to play all these school projects? Well, it’s a bit like my festival. It snowballed. It also started in Heimbach by the way. We had this idea that we had to do something and I wrote a concept. We, as artists, want to do it for free. Whenever we are somewhere for concerts, we go to the schools in the morning or afternoon. But of course we can’t organize it. So we need somebody to connect the artists and the schools and then to arrange a date. Actually, one lady is doing it right now for free, so we are desperately looking for a sponsorship. We have a fantastic group of people doing these concerts: 80 to 100 people basically. I never told anybody what to do: the children just have to see and hear us at work. We even have a composer and a conductor in our group! I usually go into a question/answer game with them. They get more involved like this. But a colleague does a quiz with them. Ideally schools and music schools should work more closely together. In Nordrhein-Westfalen in Germany we have a very interesting initiative “Jedem Kind ein Instrument” (Each child his own instrument): it has its problems but the idea is great! It would be fantastic if each child would learn to play an instrument. And some dreams (think about Venezuela and Dudamel) can come through!